Emerging technologies like blockchain and artificial intelligence (AI) are generating a lot of buzz, but most companies haven’t adopted them yet. 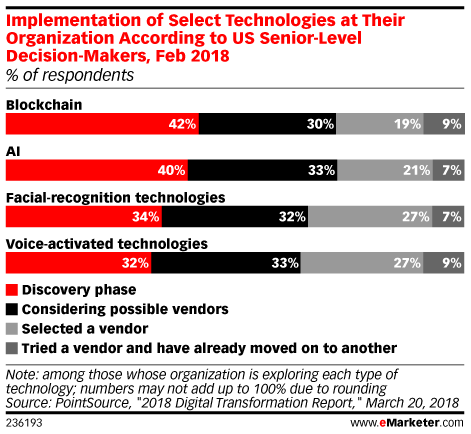 In a PointSource survey of 679 senior-level decision-makers in the US, most respondents indicated that they’re not using blockchain, AI, facial recognition or voice-activated technologies at the moment. Only about a third of respondents said they had selected or replaced a vendor in these categories. The other two-thirds were either in the discovery phase or considering possible vendors. One factor holding back adoption rates for new technologies is that many marketers aren’t ready for them. In a November 2017 poll of 500 marketing executives worldwide by Conductor, a combined 57% of respondents said they felt most unprepared for voice search or AI. And while some of these emerging technologies hold a lot of potential, they still face an uphill battle in fixing some of the problems in the marketing technology industry. For instance, blockchain’s open ledger of transactions could theoretically make programmatic ad buying more transparent. But blockchain transaction validations currently take several seconds to verify, and since programmatic ad buying occurs in milliseconds, blockchain is too slow to work in real-time bidding (RTB). At the moment, the applications for these technologies are often confined to very specific use cases. Marketers are using AI to automate audience targeting, ad buying and the creation of custom audience segments. But in a December survey of 500 marketers by Freedman International and ClickZ, just 7% of respondents said they currently use AI-powered chatbots. And in a 2017 Digiday poll of 30 marketing executives, most respondents were not using AI. But tech vendors have reason to be hopeful. Among those polled who weren't using AI, 85% wished they were.